The experience of the BURAN program on provision, confirming and maintenance of reliability and safety of the Orbiter on the required level is summarized. The main methodical approaches designed for performance of the set requirements are explained, positive results of their usage are marked. The role of the reliability programs is shown. The information on the system of guaranteed maintenance of reliability and safety are displayed, perspectives of its application and improvement are analyzed. The development of the BURAN Orbiter made to revise the existing systems of methodical approaches and organizational-engineering support of the project. Before creation of BURAN, at designing the technical systems of different purposes the aircraft and space industry of the USSR separately decided the questions of reliability and safety. The BURAN Orbiter is different for its characteristics and conditions of usage from both aircraft, and space vehicles. This new advanced design integrated both branches, made them to take a fresh look at these problems and to revise all the system of methodical approaches and organizational-engineering of the projects. Thus, in the military aircraft industry the system of General Technical Specifications (GTS) correlates all the complex of individual norms, standards and instructions. The similar documents for airplanes of the civil aviation are Airworthiness Norms of Civil Airplanes (ASCA), Air Rules (AR-23, AR-25) and Methods of Conformity Assessment of ANCA (MCA ANCA). The implementation of these documents requirements forms the basis for their certification. satisfactory completion of flight at the regulated number of failures of the constituents of the system. For compliance with the indicated requirements, specialists of NPO MOLNIYA under the methodical direction of LII determined three multidimensional fields of possible BURAN Orbiter operation. First field is one of Orbiter normal operation and its constituents. The second field is characterized by change in the onboard systems condition, decreasing the level of their functionality. A safe completion of the flight became problematic within the limits of the third field. At installation of the boundaries of the first field, the maximum permissible values of the flight performances, stability and controllability, parameters of electromagnetic compatibility, materials properties, vibration loads and other obliged limitations were used as the initial specifications. They were resulted from fundamental researches and generalization of all operational experience of aircraft and space vehicles. The normative requirements were summarized in the unified document making the code of more than 800 requirements to onboard systems. By the analogy with ANCA, the document was named ‘Norms of Flight Safety’ (NFS). The implementation of the requirements, foreseen norms was determined by document ‘Methods of Conformity Assessment of NFS’. Confirmation of properties directly influencing the safe completion of the flight was carried out at research of the second field of possible Orbiter operation. An extraordinary difficult task set before the specialists. It was needed not only to determine a list of possible reasons of change in the condition, but also to select optimal ways and methods of safe flight completion at parameters transformation into another field. These researches were conducted to the depth of three possible independent transformations of the condition of the analyzed component (of onboard system). The third field was determined by the results of studies of the first and second field boundaries. The general methodology of reliability and safety provision and confirmation is displayed in the Figure. Reaching and confirming the parameters of reliability and safety was provided within the framework of ‘Complex systems of quality control and efficiency of developments’ created in NPO MOLNIYA. The complex program of reliability and safety (CPRS) was the organizing document. Development and working out of BURAN Orbiter proved the expediency and good prospects of such documents and necessity of CPRS including into the list of normative-technical documentation which was obliged at development of complex technical systems similar to BURAN Orbiter. Such program determines the structure, sequence, organization, methodical fundamentals, contents and stages of accomplishment the actions ensuring the preset levels of reliability and safety. organization of a system of registration, collecting and analysis of reasons of failures and deviations in complex technical system operation at tests and maintenance including personals’ error analysis. The program covers the stages of CTS activity cycle: design, manufacturing, tests and operation. The reliability and safety program is extended to the technical means influencing the safety of operation, including the special means of safety control (emergency recovery aids, emergency recovery of systems functionality, means of failures localization and liquidation, etc.). The program provides the experimental working out of the appropriate means in conditions of maximum approximation to the actual ones, with simulation of possible emergencies. The task of Orbiter flight safety control at prevention or decrease of the degree of risk from the consequences of failures or damages has demanded planning and accomplishment of marginal (limiting) tests of Orbiter’s airframe and its onboard systems. Despite the absence of experience, the set task was successfully solved by the team of NPO MOLNIYA. At exploratory tests the maximum permissible and boundary values of the preset performances were determined and confirmed with engaging practically all the branch experimental and scientific-theoretical base of the leading institutes. The experimental researches of aerodynamic performances were conducted on 85 different by complexity and scales aerodynamic models in 25 wind tunnels of TsAGI, SibNIA, ITPM SO AN. The limiting values of the expected acoustic load on Orbiter’s surface were evaluated during the tests on small-scale models on experimental bases of TsAGI, LII and other leading institutes of Ministry of Aircraft Industry and Ministry of General Machine-Building. The boundary values of the flight and take-off and landing performances of BURAN Orbiter determined by the methods of mathematical modeling and semi-natural simulation on piloted-research stand of, TsAGI, LII and other leading institutes of the branch. The working-out tests were conducted on the specially created stands of the plants-developers and on complex stands and experimental vehicles. 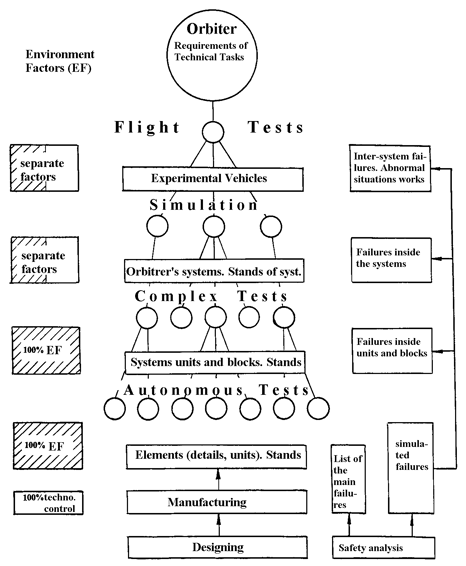 0.11 – repeated static tests of structure’s elements of the airframe. Special tests were carried out for confirming the compliance with the requirements with specificity of he Orbiter exploitation. Experimental studies on flying models and flying laboratories (FL) have allowed, at a limited number of flight tests, to provide the verification of parameters of BURAN Orbiter reliability and safety. The launch of the BOR-4 experimental flying vehicle into artificial-satellite orbit with consequent descent into atmosphere along the of BURAN Orbiter’s trajectory was carried out to refine the thermal performances and to work out the Orbiter’s thermal protection system (TPS). The launches of Bohr-5 large-scale flying model were accomplished along a sub-orbital trajectory with the purpose of aerodynamics, flight dynamics and heat interchange performances study. MIG-25RBK – test of tiles and flexible heat protection under full-scale conditions. Horizontal flight tests were carried out on the number 0.02 vehicle in amount of 24 flights for working out the automatic landing. It is necessary to note the creation of a unique complex of the ground-based technical equipment, which has permitted to fulfil all volume of flight tests at a high level. The industrial component was provided with implementation of especially important (certified) techniques in accordance with the General Technical Specifications and ‘Provision 75’. The operational component was provided by the wide use of the built-in system of diagnostics and means of nondestructive inspection. The first stage of the works has shown that the required no-failure operation of all Orbiter’s components does not give a full guarantee of safety of its operation. Therefore, it was required not only the tests of no-failure operation, but also the engineering analysis of Orbiter’s systems operation. It was needed to detect possible types of failures of units (and their combination) and units, which single failures, result in emergency or catastrophe. The existing methodology of the analysis of safety did not guarantee 100% of detection and registration of all possible failures. Experts of NPO MOLNIYA, together with LII, developed new methods of different class systems analysis. It has allowed, as early as the design stage to conduct an overall analysis of BURAN Orbiter’s systems operation at all possible types of failures of units with allowance for available external connections. The new method of operation-after-operation analysis underwent a successful approbation. This method is based on study of influence of possible condition changes in systems (complex of landing equipment, hydraulic and control systems of BURAN Orbiter, onboard cable network, means of distribution and switching of electric power) on their operation. The first stage of analysis is characterized by creation of a model displaying the real properties, condition and connections of a system. The base vehicle of model connecting the properties of the system and identifying the logic of its operation is the logical circuit of algorithm known in the theory of discrete systems. The second analysis stage consists of determination of kinds of possible conditions. in the process of analysis, it was required to change the logic of the main undercarriage support braking control system, to increase the safety margins of the undercarriage units (wheels disks, tires, etc. ), to carry out the adaptation of circuits of electric and hydraulic feeding of controls, adaptation of the onboard feeding cable network, control system, etc. in more than 800 points. For experimental confirmation of the analysis results, the lists of simulated failures were developed. Possible consequences of the entered failures (445 types of failures were simulated) were checked up in independent tests and were tested on complex stands (over 10 complex stands). For classification of situations and developing the guidelines on theirs handling, over a thousand versions of control of Orbiter’s mission motion was examined. At working out the list of abnormal situations the 182 situations were simulated (on Piloting Dynamic Stand for Training - 93, Full Scale Stand of Equipment - 9, Piloting Static Stand - 18, at mathematical modeling - 31). All these researches have allowed determining the field of the Orbiter and its subsystems safe operation having separated it from the third field. analysis of the especially important mechanical devices and other units of the Orbiter. The use of functional systems on different physical principles in the BURAN Orbiter development, and their analysis showed possibility of application of the complex program of reliability and safety in any industry for CTS of different economic and functional purposes. It is necessary to note the first positive results of guaranteed provision methods application in gas industry. Real prospects of its application for the analysis of the railway transportation systems, heat engineering complexes and water supplying systems which remain the most potentially risky in conditions of densely populated cities is existed. Until recently, this analysis was postponed in view of absence of sufficient financing of the branches. Flight of the BURAN Orbiter has actually proved the possibility to create a completely automatic unmanned large-scale transport airplanes for delivery of payloads into orbit with consequent recovering to one of the base airfields. The methodology of guaranteed reliability and safety levels of the BURAN Orbiter should be laid in the base of development of high-reliable and failure-free aerospace system, in particular, in project of the MAKS Multipurpose Aerospace System. The worked out methods should be improved in view of the last technological achievements and modern element base. to apply automation of the process of safety analysis of CTS operation and subsystems of different principles of operation including that on the basis of the offered methodical guidelines and rules.